Ian Scott was born on the 23rd August, 1940. Ian has been involved in woodchopping and sawing for 50 years. A natural and competitive sportsman, Ian played Tennis, Rowing, Gold and was a very well regarded Footballer for Kermandie and a Huon representatived. Returning from a rowing regatta one day the locals involved Ian in a chopping and sawing carnival, he tried it and was hooked. 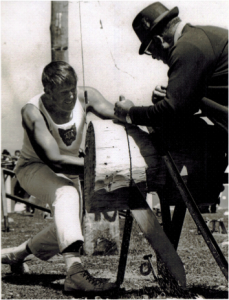 In 1970 Ian won his first 18inch Single Handed Sawing Championship at Ulverstone. He defended and wont his title again in 1974. With 2 World Records to his credit his records show that he has won 70 State Titles in Single and Double Handed Sawing. Ian has also won 2 Australian Single Handed titles and 2 Australian Double Handed titles. Ian’s sawing partners included Wayne Brown, Tony Watson, Maurie Russell, Clayton Stewart and Bill Youd. Ian is currently a member of the Australian Veterans Team, enjoying competing in Australia and New Zealand. Ian has had success in his later ears at the Sydney Royal Easter Show in Veterans Sawing events which he has thoroughly enjoyed as in his younger days work commitments on the family property made it impossible at Easter time for him to attend. 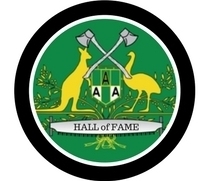 Not only has Ian competed he has contributed for many years at an administration level within the Southern Tasmanian Axemen’s Association gaining him Life Membership recognition for his contributions to the sport of woodchopping. Ian has always been involved with the organisation of the Geeveston Carnival. Away from woodchopping, Ian is a Justice of the Peace and holds a 35 year service certification. Ian is very well known around woodchopping areas in Australia and New Zealand. Ian has supported, competed, promoted, coached and always encouraged others to participate. His involvement, commitment, fairness and no nonsense approach is certainly a true credit to him.